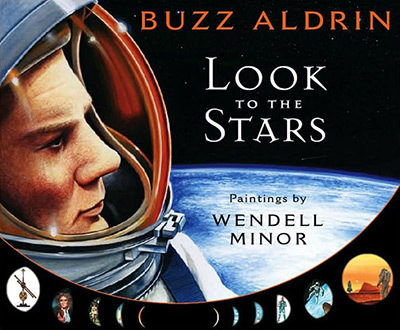 Look to the Stars is not just another children’s book about Apollo. Instead, the first-person narrative by NSS Governor and Apollo 11 astronaut Buzz Aldrin puts the accomplishments of Apollo into the personal and historical context of the human quest to reach the stars. The narrative moves in chronological order, covering significant milestones in aviation and space, from the Wright brothers’ first flight to the building of the International Space Station. Quotes of famous people at the bottom of each page add depth and meaning to the brief descriptions of their accomplishments in the text. One of my personal favorites is Saturn V rocket designer Werner Von Braun, saying, “Basic research is what I am doing when I don’t know what I am doing.” I can just picture my five-year-old (take-it-apart-to-see-how-it-works) nephew adopting this answer next time my sister asks what he thinks he is doing! Though space enthusiasts will likely enjoy explaining aerospace terms to the children in their lives, a typical elementary student may find this book a challenging read. The text mimics the voice of the astronaut, stating facts clearly and concisely, but making liberal use of technical words (elliptical, reflecting, rendezvous) unfamiliar to most children. Sentences up to 40 words long with multiple dependent clauses and three-syllable words add difficulty. The book also does not contain a glossary. The last page spread is devoted to a timeline that starts with Copernicus in 1543 and ends with the retirement of the space shuttle in 2010. Like the rest of the book, the timeline integrates personal and historical facts. For example, his mother and father’s birth years are on the timeline between the discovery of Neptune and the flight at Kitty Hawk. His own birth in 1930 and the 40th anniversary of his landing on the Moon this year are also included. These personal milestones remind us just how far our understanding of the stars, and our ability to reach them, can progress during a human lifetime. As Aldrin says in his section on the future in space, “One day your family may have some amazing vacation choices. Where will you go? Will it be to the seashore on Earth, or to the Moon’s Sea of Tranquility?” After reading this book, I bet most children will raise their hands for the Moon!